I’ve been cooking with Rosebud since she could sit in her high chair. Back then she wasn’t directly involved with the cooking, but she sat in the kitchen observing everything I was doing. I put spoons, measuring cups, a mixing bowl and pretend food on her tray which kept her occupied as I chopped vegetables, mixed cake badder or mashed potatoes. I’d show her the foods and let her sample them as she got older. I remember times when I’d read a recipe, tell her the ingredients we needed to add and she’d repeat after me. Now that she’s a toddler, she’s an active participant. She counts and takes out the eggs, mixes cookie dough or fills the measuring cups and spoons to scoop and pour the ingredients. Her favorite saying these days is, “I try it.” She wants to do and try everything! 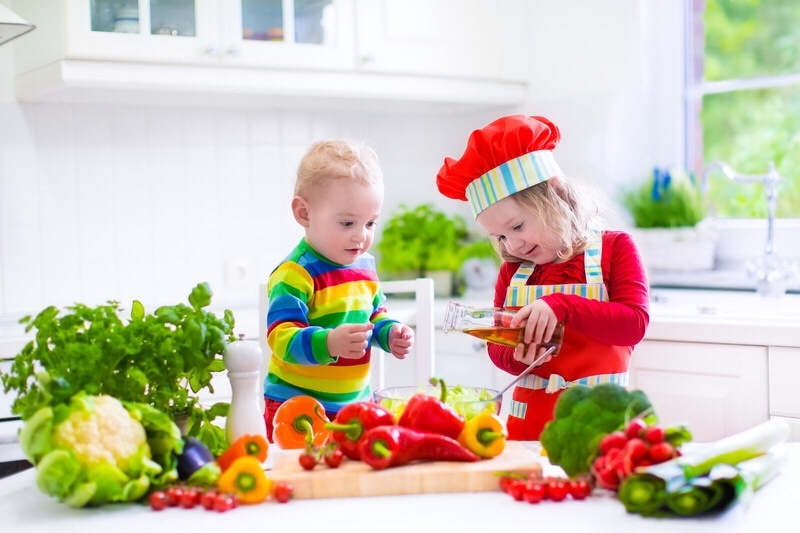 Kids can learn names of foods, spices and and the equipment and utensils we use to cook with. They can learn opposites. Hot and cold, wet and dry etc. You can talk about foods being sour, sweet, salty or bitter. You can talk about colors, shapes and textures of the food. If your child is older, reading the recipe can help build vocabulary as well. Yesterday as we were mixing together some sugar, butter and eggs for cookie dough, Rosebud told me, we need to hatch these eggs. At first I didn’t know what she was talking about, but then it hit me that to her cracking the eggs is hatching them. 2. Cooking teaches math and science. Kids can learn about temperature. Hot vs. cold. What happens when ingredients warm up, boil or are frozen? They can learn about measurement by using measuring cups and spoons. They can learn about consistency. What happens if we add water or flour? They can learn about plants and where food comes from. What is inside an apple or a pepper? The possibilities for teaching concepts and experiments in the kitchen are endless. When kids help make choices about their food, they are more likely to try new things. In the preschool class where I work, we participate in this program where a nutritionist comes in to teach the children about healthy eating and where food comes from. There is a garden where she takes them to get vegetables and it is surprising how many new vegetables they have tried because they have picked the vegetables themselves. 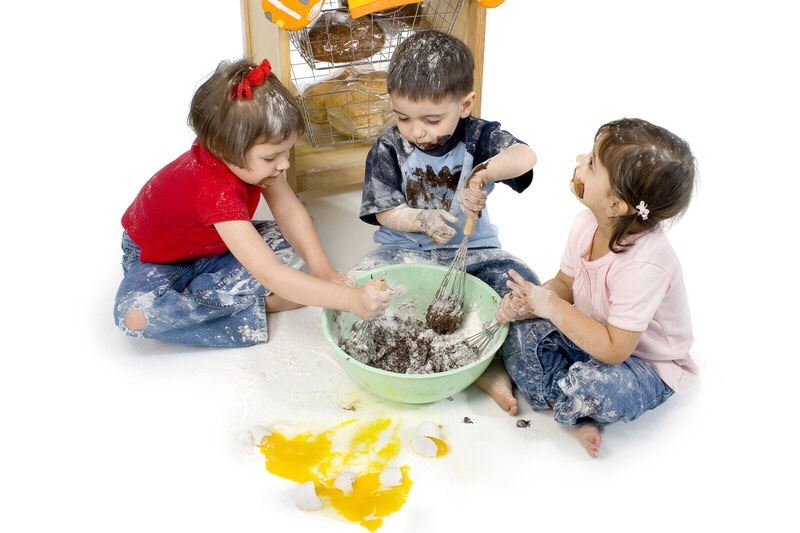 We’ve also done a bit of baking in preschool. The kids help add ingredients, mix badder and once we even allowed them to help us with cutting up fruits for fruit salad. This makes them so excited about afternoon snack. They can’t wait to try what they’ve made and share it with their families. Rosebud loves to try bites of vegetables or fruits when I chop them up for salads. I also ask her which fruits and vegetables she wants when we are grocery shopping. She loves seeing the food and pointing out what she wants. I’ve never seen another kid get so excited about broccoli. 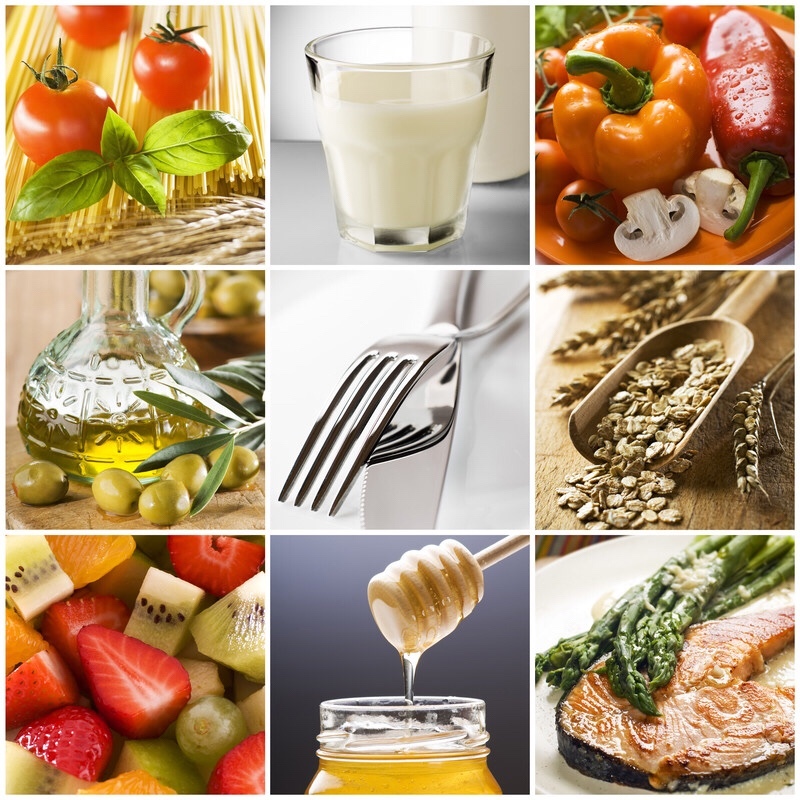 When you are making a home cooked meal, you know every ingredient that is in your food. This is obviously healthier than a frozen or fast food meal. Even if you are baking treats, that is healthier than the prepackaged snacks. Not to mention trying to decode the nutrition labels. 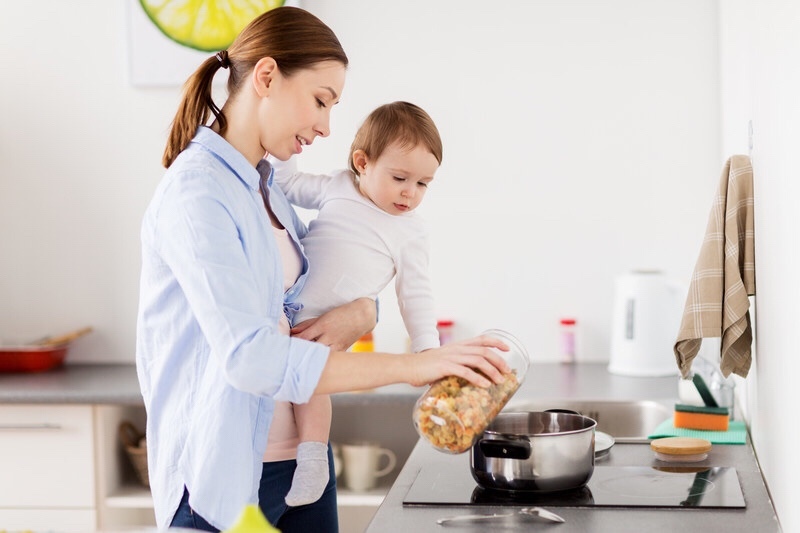 For many families there is little time to prepare a meal so frozen may be the way to go on nights when you have to be in several places at once or do a million things. Nothing beats the convenience of prepared meals. However, I try to avoid those meals when I can especially for Rosebud because I like knowing what is in her food. I also want her to like the taste of foods that don’t come in a can or box. She enjoys fresh fruits, veggies and home cooked food. 5. Cooking can be together time. I like when Rosebud stays in the kitchen with me while I cook. If she’s helping me, she’s learning about food and having fun. We can spend the time talking or sometimes she will pretend to cook with her play foods or sit in her chair with crayons and a notepad. I don’t get to spend much time with Rosebud on week nights so I try to find ways to include her in what I’m doing. On other nights, she prefers to have screen time while I make dinner and wash dishes. It’s not the greatest option, but sometimes it’s the only way to get things done. I try to maintain a balance and create ways to spend time together even when I have endless chores to do. I find that cooking usually interests kids and great memories can be made from it. I have happy memories of baking with my grandmother when I was little and hopefully one day Rosebud will remember cooking with me.